Tour Inclusions: private tour guide, private transportation, entrance tickets to tapestry museum in Bayeux, taxes, tolls and parking. Departure Points: Le Havre, Honfleur. Other departure points available. NOTE: All our Bayeux and Honfleur private tours are private and can be fully customized. Inquire about customizing your private tour of Normandy. 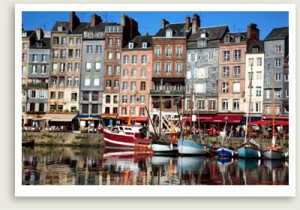 Let Well Arranged Travel take you on one of their memorable upscale and private Normandy tours. These private Normandy shore excursions are customized to include all the Normandy sites you wish to see. Inquire about tour suggestions and assistance in designing your day for that unforgettable tour of Normandy. Embark on one of our Normandy private tours, a shore excursions from the ports of Le Havre, Caen, Rouen, Honfleur and Cherbourg to Honfleur and Bayeux with one of our fantastic English-speaking tour guides. 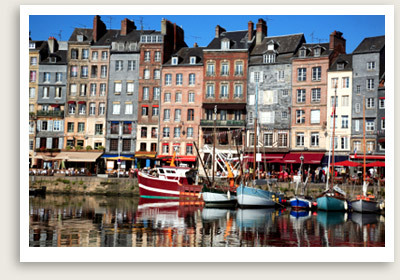 You will begin your shore excursion with an Honfleur private tour. At the heart of the charming port town of Honfleur, the old dock is full of character, from its old crooked-faced slate-fronted houses to the art galleries and cafes some located in converted salt stores. Eugène Boudin and Claude Monet were among the famous impressionist painters who drew inspiration from the Honfleur port. You will have time to visit a few sights in town, perhaps St. Catherine’s Church, which is the largest wooden church in France, built by the town’s shipbuilders in the late 15th century. The Eugene Boudin Museum in Honfleur, set in a 19th century chapel, will be of interest to art lovers. The town’s farmer’s and flea markets are also fun places to stroll and shop (inquire for days and times). Your private shore excursion in Normandy will then take you to a tour of the small historic town of Bayeux, home to one of the oldest tapestries in the world. The 230-foot-long medieval cloth explains through its embroidered Latin inscription and pictures the events surrounding the 1066 Norman invasion of England, which began here. The Bayeux tapestry is on view at the Bayeux Tapestry Museum, which you will visit on your tour.